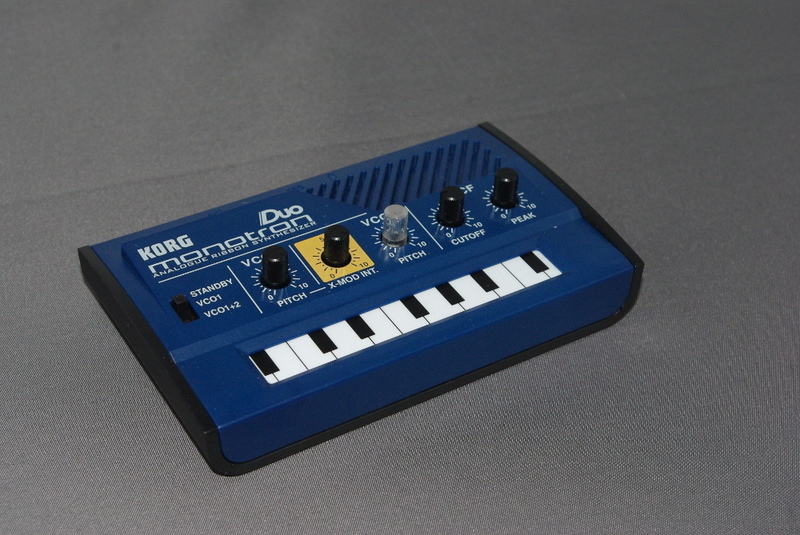 Korg has taken modules from its classic MS-20 analogue synthesizer and packaged them as a series of pocket-sized, limited function synths with ribbon keyboards. This Monotron Duo was a gift, and what a great one it’s turning out to be. This teeny-tiny synth looks at first glance like a toy, superficially resembling a Stylophone, but it turns out that the circuitry inside really captures some of the MS-20 magic and despite its limited controls it can make some pretty impressive sounds. The Duo comprises two VCOs and a VCF. There is no envelope generator, it’s just on when you touch the little keyboard and off when you don’t. It also has the ability to modulate the frequency of VCO1 with the output of VCO2, which leads to some surprising and useful sounds. The best part is probably the VCF which packs all the punch of the MS-20 VCF and rings just nicely when the Q is wound up. It’s unlikely you’d be able to play much of a tune on the keyboard. It does have a miniature built-in speaker which is useful but of course can’t do justice to the sound, especially the beefy bass that this little gizmo can pump out. So here’s a short demo. The output has been put through the mono-to-stereo converter, a graphic equalizer and a delay/reverb effect.